©Teresa Wentzler, PO Box 176, Montoursville, PA 17754. All rights reserved. 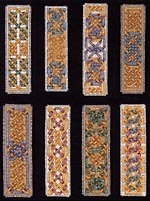 Description: A collection of 8 different Celtic knotwork bookmark patterns charted for DMC (or Anchor) floss. Background Information: I've received many requests over the years for bookmark patterns, and finally got around to doing some. I chose knotwork patterns because they are rather addictive to design, and because Celtic-influenced designs seem to be favorites of many stitchers. Stitching Comments: This collection has a nice variety of knot patterns. While they are fairly small, they may take you longer to stitch than you might first guess. The shading in the patterns is very straight-forward; changing colors, should you so desire, should be quite easy.